Mullingar travelled to the Railway Union knowing that a win was needed to restart the campaign, after some faltering results. 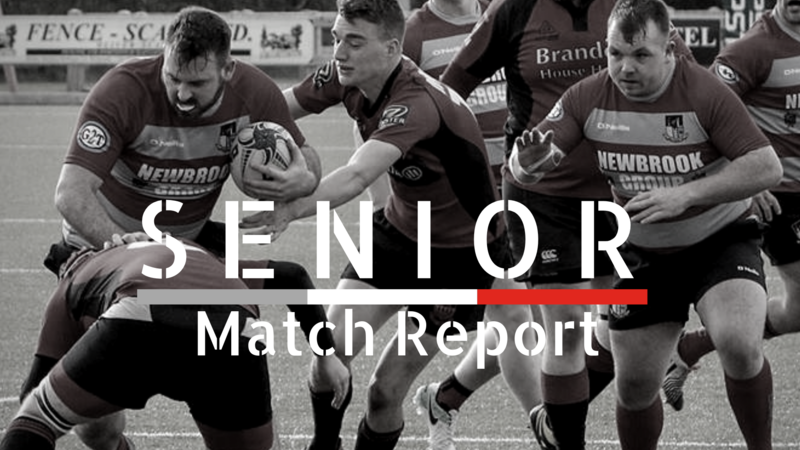 Although missing a few players through injury and unavailability for other reasons, Mullingar came away with a bonus point win to boost the morale for a few tough games coming up. Mullingar started well and were on the attack straight away, pressing in the Railway half. It only took 8 minutes for Mullingar to open the scoring after a flowing move resulted in winger Paul Smyth receiving the ball just inside the Railway half and slicing his way through for a try, which was converted by Tom Campbell to put Mullingar 0-7 up. Railway got their scoring off the mark just 5 minutes later with a penalty to reduce the deficit to 3-7. Mullingar were putting a lot of pressure on the Railway line out and either won or disrupted their ball. Mullingar missed a penalty kick to restore the lead to 7 points coming up to the 20th minute. From a Railway line out around the halfway line Alex Mitic caught the ball and made about 30 metres before being stopped.Keeping up the pressure Mullingar won a further line out about 10 metres from the Railway line and with the ball going to Ben Glennon, he powered his way through the defence for Mullingar`s second try to now leave the score at 3-12. Stung from the second Mullingar try, Railway upped their game and managed to score a try which now put the score at 8 -12. Mullingar reacted well to this setback and went on the attack again, with the front row of Darren Brady, Alex Mitic, Johnny Moran ably assisted by 2nd row of Ben Glennon and Killian McNay managing to push their opposite numbers back on a number of occasions. The back row of Darach Geraghty, Cormac Dunne and Captain Daryl Quinn were more than able for their opposite numbers and dominated throughout the game. Mullingar`s dominance resulted in a third try just before half time when Arthur Brabazon, back to his best in hassling the opposition and sniffing out a break, darted through for Mullingar's 3rd try, converted again by Tom Campbell to put Mullingar into the halftime break at 8-19 ahead. The second half started brightly for Mullingar and we had our 4th try in the 3rd minute when again Ben Glennon powered over for his second try and a quick clear out in a ruck by Cormac Dunne. TC converted to put thescore at 8-26. A comfortable lead but Railway reduced this with a tryof their own in the 51st minute, which was also converted to put the score at 15-26. After 7 scores in the first 51 minutes the remaining 30 minutes were scoreless, but fought out hard as neither side were willing to give another score to their opponents. There were some anxious moments for the away side but our back line, marshalled by TC at outhalf, kept Railway scoreless for the rest of the game. A new partnership at centre in Eoghan Moore and Danny Gilleran assisted by wingers Alan Donoghue and Paul Smyth and with Sean Rock at fullback, darting by the opposition at every available chance, it proved to be a fruitful day for Mullingar. We withheld a number of attacks and finished the game being awarded a penalty 5 metres from the Railway line, which was dispatched into touch for the final play. Mullingar are now up to joint 5th in the league table with the team immediately above, Wexford Wanderers our next game at home in Shay Murtagh Park on Sunday 11th. Note; Tickets for the Mullingar RFC on Ice Event for Sunday December 16th at 18.40 will be on sale in the Club shop next Saturday morning.